The Roberts Funeral Home was founded in 1840 by William Harrison Roberts (1819-1906) who was born in Wayne, Maine. William was a cabinetmaker and undertaker. He established an undertaking business in Wayne. 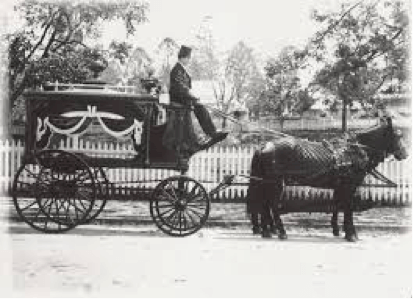 A second generation began with William’s three sons; Charles Ellery Roberts (1826-1906) who followed in his father’s footsteps as a cabinetmaker and undertaker. William Love Roberts (1855-1929) served as an undertaker in Canton, Maine and later as a furniture merchant in Needham, MA. Frank Herbert Roberts (1858-1919) served as an undertaker in Vernon, Maine. Third generation included: Leslie Freeman Roberts (1882-1981) who served as a coffin and specialty furniture manufacturer and undertaker in Richmond, Maine. In 1936, Leslie was treasurer of the Maine Funeral Directors’ Association. Another location of the Roberts Funeral Home was established in Georgetown, MA. Merton Ellingwood Roberts, Sr. (1898-1967) served as an undertaker in Georgetown. Leon Chester Roberts (1886-1954) served as an undertaker in Winthrop, Maine. The fourth generation included: Frank Samuel Roberts (1919-2006) who served as a Funeral Director in Georgetown and then before World War II established a new location on Main Street in Rowley, MA, the Frank S. Roberts and Son Funeral Home. The present location on Independent Street was built in 1891 by the Burke Family. They conducted a business in Ipswich, MA, and also owned houses on Burke Avenue where their employees lived. The original home had an attached barn which was moved next door on Summer Street where it now exists as a duplex home. There was also a smaller house between the main building and Summer Street that was moved to a location across from the present Rowley Veteran's Association on Bradford Street. In later years the Ebinger family purchased the home and lived in it until Frank S. Roberts purchased it in 1955, at which time he moved the funeral business from a small house on Main Street to its present location. David W. Roberts and his wife Henrietta “Gidget” purchased the home in 1984 where they continued to conduct the business and also live and raise their family. The fifth generation of Funeral Directors includes Terry L. Roberts who served as a Funeral Director in Winthrop. David Williams Roberts, who was born in Ipswich, MA in 1948, worked alongside his father in both Georgetown and Rowley until 1984, when he purchased the family business from his father. David served as a Funeral Director for 45 years. In October 2015, David entrusted the fifth generation family business to Jeffrey E. Megna, a first generation Funeral Director and Embalmer. Jeff has almost forty years of practical and theoretical experience in funeral service and is proud and honored to continue the long tradition of providing dignified, reliable and personalized service in a home-like setting.